Posted in: 1 Pageant Pages, 2 Shout-out-Looks. Tagged: Cecilia Bolocco, Dania Patricia Prince Méndez, María José Alvarado Muñoz, Miss Earth 2003. Miss Earth 2003 Dania Patricia Prince Méndez: the only major international beauty pageant winner from Honduras. There are a few good reasons why this lovely lady is the subject of our Throwback Thursday post. For starters, Miss Earth 2014 is going to be crowned two days from now. Second, Dania Patricia Prince Méndez is the only beauty queens from Honduras that has ever captured a major international beauty crown. And third, the late Miss World Honduras María José Alvarado Muñoz has been in the news for the past two weeks. Hence, the connections fit somehow. In my eyes, this Latina with a British-Honduran mix is comparable to Miss Universe 1987 Cecilia Bolocco, pageant wise. They both arrived in their respective beauty contest venues claiming the status of top favorite from beginning to end. They both exuded the same poised and elegant stance that made them effortlessly stand out among all the candidates. 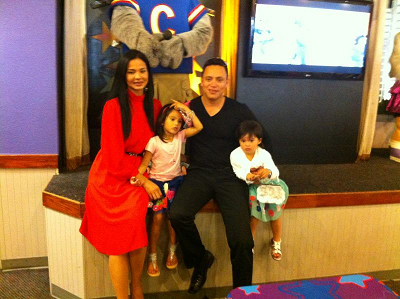 Dania in a not-so-recent family picture with her husband Frank Fuentes and two daughters. And lastly, they conquered their respective finals night with a presence so regal that the strong presence never escaped the eyes of the board of judges. Dania, having joined both Miss Universe (1998) and Miss Earth, gave a very clear comparison of both competitions according to a newspaper interview she gave to Manila Standard back in 2004. Dania Patricia really looked stunning when her name was called as Miss Earth 2003. Napagod ata yun isang candidate at nakaupo habang nag farewell walk si Miss Earth 2002. Kuya Norman, I have reviewed your top 16 list…it saddened me that Miss Autria wasn’t there! I hope she can pull a surprise for you come coronation night! I think it is high time ulit for Miss Earth to give more emphasis on purpose and cause rather than beauty. I’ve noticed that for the past years, those who can be really good environment ambassadors end up with the elemental crowns, as finalist, or worst, excluded from the top 16. I remember back in 2012, there were so many girls who have more passion towards the cause. Although I adore Teresa, I think Miss South Africa Tamerin Jardine should have been given a spot in the Top 4. I disagree with you on Teresa Faksojva. She became the most traveled Miss Earth ever! And compared to Alyz, who in my opinion did less during her current reign. Katia Wagner did a better job as Miss Air so far. Teresa did really well on her reign. I’m not bashing her though. It’s just that there are also other girls who might also do well. I agree with you on Katia. Halfway Alyz’s reign, I was already feeling that she might get dethroned. And now, Katia was not invited by Carousel for the coronation which saddens me. I think Miss Earth has become more of a beauty pageant than it’s true essence of being a cause-oriented pageant. Parang nagiging plainly pagandahan nalang siya which is sad coz I really loved the past queens. Why does BPCI insist on boring colored muslim princess costumes?!? Ok, I’ll admit na this is in a better color than what they made Bianca Guidotti wear but our costumes from down south are very vividly colored!!! Rich gold, magentas, lapiz, verdant greens, deep blacks… Haaaaaaaayyyyy!!! !